The lion's masquerade : a sequel to The peacock at home / written by a lady ; illustrated with elegant engravings. Dorset, Catherine Ann Turner, 1750?-1817? Dorset, Catherine Ann Turner, 1750?-1817? Peacock at home. Written by Catherine Ann Dorset, cf. Moon, cited below. Authorship has been questioned; cf. Osborne, p. 61. Frontispiece, ill. engraved by Springsguth after William Mulready; cf. Moon. First sentence: "As Aurora stept forth from the gates of the East, With her garland of roses, and dew-spangled vest, A clamour unusual assaulted her ear, Instead of the Lark, and her friend Chanticleer, At least though their voices she sometimes could trace, they seem'd overpower'd by the whole feather'd race: And such was the chirping, and fluttering then, It rouz'd an old Lion asleep in his den; Enrag'd at this racket so much out of season, He, roaring, sent out to ask what was the reason, And the Jackal soon learnt from some stragglers about, 'Twas the company come from Sir Argus's rout." Copy in McGill Library's Rare Books and Special Collections: engraved frontispiece; 5 engraved plates by Springsguth after William Mulready. Bound with The elephant's ball, and grand fete champetre. 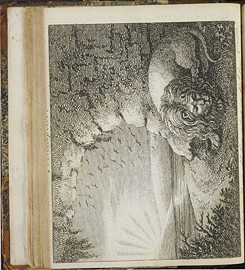 London: Printed for J. Harris, successor to E. Newbery, at the Original Juvenile Library,1808. Bound together subsequent to publication with 4 other Roscoe imitations. Without original wrappers. Marbled paper over boards, leather spine. John Harris's Books - Moon - #214(3). Forgotten Children's Books - Tuer - p.157. Benjamin Tabart's Juvenile Lirbary - Moon - #31(2). Adelphi Book Shop. Victoria, B.C. Oct/69. $175.00. Justin Schiller. New York - '83 - $85.00 for this one chapbook; Hobbyhorse Books. Ho Ho Kus, N.J. - '93 - $325 for this one chapbook. text.chapbook.black and white, 13 cm.